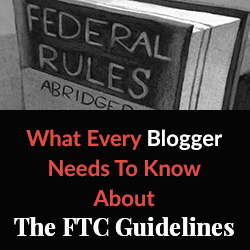 There has been a great deal of confusion among bloggers since the Federal Trade Commission (“FTC”) issued updated guidelines in March 2013 regarding if and when disclosures must be made in connection with online advertising (the “Guides”). This article will summarize some of the most important guidelines and how they may affect bloggers (the complete Guides are available here). This article does not constitute legal advice and is provided for informational purposes only. In this instance two disclosures are required, that she is being paid by Fat-away and that her weight loss is not typical. Such disclosures would also be required on a social media channel with limited space such as Facebook status updates, sponsored Pinterest pins or photos posted on Instagram. Disclosures must also be “clear and conspicuous.” According to the Guides that means the disclosure “should be placed as close as possible to the claim they qualify.” As an example, in a post reviewing a blender, if the blogger received the blender for free from the manufacturer in order to review it that fact should be disclosed early in the post, not at the end or via a link or button that takes the reader to another page where the disclosure is made. It is important to remember that the Guides only apply to endorsements if the company providing the product or service, or someone working for that company, paid the blogger for the endorsement or gave them something of value. If a blogger reviewed a new camera in a post and they received the camera as a gift from a family member or friend, won it in a contest, or purchased it themselves then no disclosure is required. This article addressed some of the main issues bloggers should be aware of in the Guides. Additional information is available in the Guides (especially in the examples at the end) and in a FAQ provided by the FTC (available here). Whether or not an FTC guideline applies to a particular activity is a highly fact specific question and bloggers should consult with an experienced e-commerce attorney if they want specific advice on their situation. Mark is the co-founder of Davis & Leonard LLP, a boutique intellectual property transactional and litigation firm in Sacramento, California. 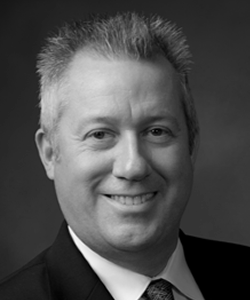 Mark’s practice is focused on copyright and trademark prosecution, enforcement, licensing, and litigation in the areas of trademark and copyright infringement, e-commerce, computer intrusion, Trademark Trial and Appeal Board proceedings, and ICANN Internet domain name disputes. Mark is the Chair of the Executive Committee of the California State Bar Intellectual Property Law Section (“IP Section”), the Vice-Chair of the IP Section’s Legislation Interest Group, and Secretary of the IP Section’s Trademark Interest Group. Prior to practicing law, Mark worked in government at the federal and state levels as a legislative staff member, spokesperson, and in the public relations field where he specialized in media relations and crisis communications training. This is good stuff to know. The feds are getting more serious about this kind of thing. Thanks for the info and insight!! Thanks for this.. I read something about it but never followed up. It’s about time!! The FFC is very quiet about the Internet (and congress is even more quiet). I hope this helps regulate (and control) some misuse on the ‘net. Thank you, Mark. If I ever become an affiliate marketer, I will know what I need to disclose. Great article! Very informative! I am working towards earning a certificate in IP so I find your incite very beneficial! Thanks! FTC rules have always been in place. I am not sure why some bloggers still think they do not have to do a disclosure. I have been blogging 9 years and always had to have a disclosure. Thank you for the update. Thanks for the information! Will need to revamp some of my posts.. This info is music to my ears. Great information – as an affiliate marketer, I was really unclear as to what the new guidelines are. Thanks for posting! Thank you for all of the great information, most of which I was unaware. Do you need a disclosure when writing abut restaurants if you were invited to sample the food? How would anyone know you were invited? 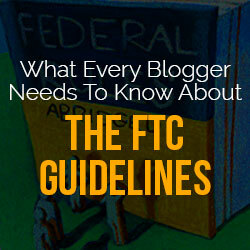 Thank you so much for sharing the FTC guidelines! I review books for a couple of publishers and make sure my FTC disclosure is included in every review. This great info and is worth to share. I agree to the Disclosures of the Ad. It must be clearly stated within the post. There has been so much confusion and uproar about these new guidelines; thanks for making it simple and concise. Terrific Website, Keep up the useful job. Thanks a ton!